4) who should not do it. Firstly sit on the floor with both the legs extended together hands by the side of the body and palm resting on the floor. 3) Then after this bend the left leg bring it from above the right knee and place it by the side on the floor. 5) Now after this bring the right hand on the left side, over the left knee and hold yours left ankle with the right hand. 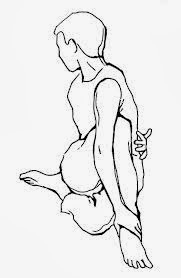 6) After doing all this step; twisting the body to the left side, look backward and place the left hand on the floor close to yours spine with the elbow straightened. 8) Repeat this step with different side. 1) It works on the pancreas, spine , kidney , stomach, small intestine , liver and gall bladder of the body. 2) It is very helpful for the people who are always suffering from the digestion problem. 3) It helps in the muscle of the shoulders and back to get supple. those suffering from the stiff back should perfrom thsi asana with care.